The Green Party of Mississippi reaffirms its opposition to war on Iraq, first presented in a statement issued in September 2002. This war is immoral because Iraq did not attack the U.S.; nor did it pose a credible threat to do so. This negates any justification for a preemptive war. The Green Party, in keeping with international law and the U.N. charter, condemns the very notion of preemptive war as a crime against peace. We oppose the war because it is a criminal offense for the U.S. to attack Iraq, kill Iraqis, and destroy their country. We condemn the Bush administration because it is forcing our military personnel to follow orders that require them to commit crimes against peace. War begets animosity and engenders hatred that lasts for generations. It is a sad day for America when our president makes war against all the better advice of world leaders, people around the globe, and millions of Americans. We condemn the hypocrisy and lies of the Bush administration. The U.S. forbids Turkey to move troops into Kurdish northern Iraq on a small scale, while the U.S. invades on a massive scale. No weapons of mass destruction are in evidence except those used by the U.S. We condemn the bombing of cities and the killing of civilians in the name of democracy. We condemn the foreclosing of dissent by a propaganda machine that tries to convince Americans that the only permissible reaction, now that the U.S. has started a war, is to support it. We declare that all Americans of conscience have the right to oppose their government’s actions, and we intend to continue that opposition until war ends. In the best traditions of democracy, anti-war protesters are willing to stand in the public eye, defend their views, and engage in debate. The Green Party declares its support for the men and women who wear the uniform of the USA. We proclaim that the best way to support them is to bring them home. We do not want them to be killed or wounded or traumatized by war. We do not want them to suffer horrors or inflict them on others. We support the troops when we call for the ending of this unjustifiable, illegal war now. We condemn the war because it will divert vital tax revenues from domestic needs. The yearly budget for the State of Mississippi, which supports public schools and universities, health services and road building, the legislature, judiciary, and governor’s office, amounts to 3.5 billion dollars per year. This amount is being wasted in a few days of war in Iraq. Americans gain nothing from this, while our government earns fear and hatred from most of the world’s people. The taxpayers of Mississippi should not be asked to bear this war’s burden. Nor should any American taxpayer. The Green Party of Mississippi, following its key value of non-violence, holds that every attempt should be made to resolve conflicts without violence. The Bush administration failed to accommodate dissent and was deaf to every proposed compromise, so there is no reason to support and every reason to oppose this violent act of war. We condemn it and call for the US to return to respect for the rule of law in international affairs, rather than becoming a tyrant in the cause of ending tyranny. 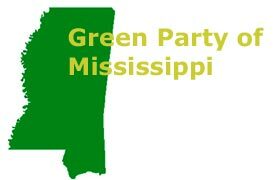 The Green Party of Mississippi dedicates itself to the cause of peace with justice, for the people of Mississippi, the USA, and the world.